Once you have generated and downloaded the Forfeiture Rate reports, you will see two tabs in the excel report. The first tab is a high-level summary of awards granted and forfeited during a specified time period. The second tab includes all the data used to calculate the numbers listed on the first tab. The Data tab lists out each award granted by each of their vesting tranches. Within the first tab, each of the Company's fiscal year, from inception to the As of Date, will be listed under row 8. Next to each fiscal year will be the sum of the shares granted during each of those calendar years, the sum of shares forfeited during those years, the aggregate forfeiture rate, a weighted opportunity period, the average opportunity period, and the annualized forfeiture rate. The Company's fiscal year is pulled from the Company's financial reporting settings under Compliance >> Expense accounting >> Settings. Granted: Shares granted include the sum of the shares granted during the fiscal year. In the example above, 885,000 shares were granted in the fiscal year starting on 01/01/2013 and ending on 12/31/2013. Forfeited: Carta's ASC718 expense reports assume that forfeiture rate is applied to grants in the current year but represent a prediction of the forfeitures that may happen in the coming years. Due to this assumption, annualized forfeiture rate is calculated for each batch of awards issued in each of those years. Thus, the 134,175 shares forfeited in cell C9 represents the unvested shares from the awards that were issued in 2013 that were terminated before the As of Date. Following the example above, of the 885,000 shares granted in 2013, 134,375 shares were terminated unvested between 01/01/2013 to 12/31/2017. By estimating forfeitures in this way, Companies are able to use a rate that is indicative of future events. Aggregate Forfeiture Rate: The aggregate forfeiture rate is simply the forfeited shares divided by the granted shares to show the percentage of shares forfeited out of the entire sample. Keep in mind that this number represents the total percentage of shares forfeiture over the entire life of the 2013 granted awards. Weighted Opportunity Period: The weighted opportunity is calculated as the sum of the number of shares for each vesting tranche multiplied by the shorter of the days passed since the award was granted and the time to vest. The resulting number represents the total time it takes for the shares granted in each year to vest which allows us to take into account for different vesting schedule of the award issued in that year. Average Opportunity Period: If the weighted opportunity is the total shares multiplied by the time to vest, then the average opportunity is the weighted opportunity divided by the shares granted in that year. This number represents the average time it takes for shares granted in 2013 to vest. Annualized Forfeiture Rate: If you were wondering how weighted opportunity period and average opportunity period plays into the forfeiture rate calculation, the answer is in the annualized forfeiture rate. 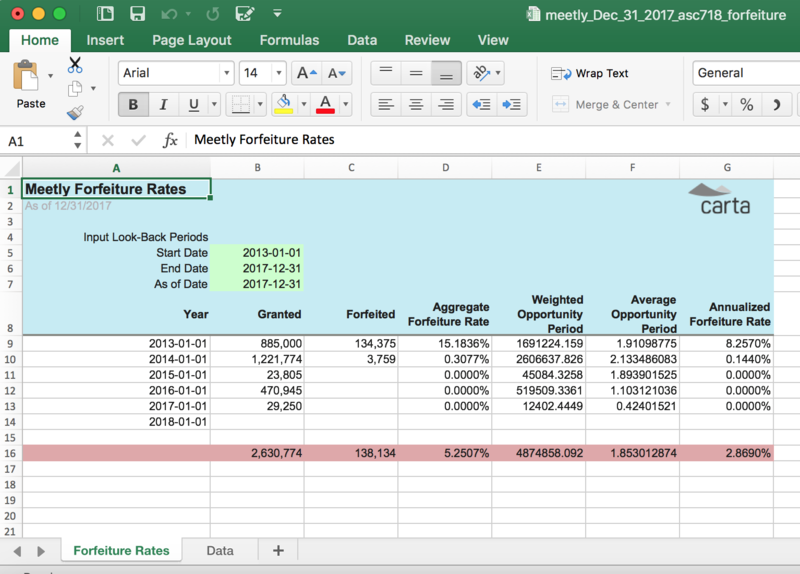 In order to annualize, or interpret the aggregate forfeiture rate into an annual number, we need to calculate the average time it takes for the shares to vest (average opportunity period). Using the aggregate forfeiture rate and the average opportunity period, we then annualize the forfeiture rate using the formula below.